It’s Friday and we’ve got the best type of blues….thanks to this gorgeous blazer from River Island! It had to be the star piece in this week’s Weekend Edit. Having had a similar blazer in a camel colour last year, once I clocked eyes on this, it went straight to the top of my Spring wishlist. 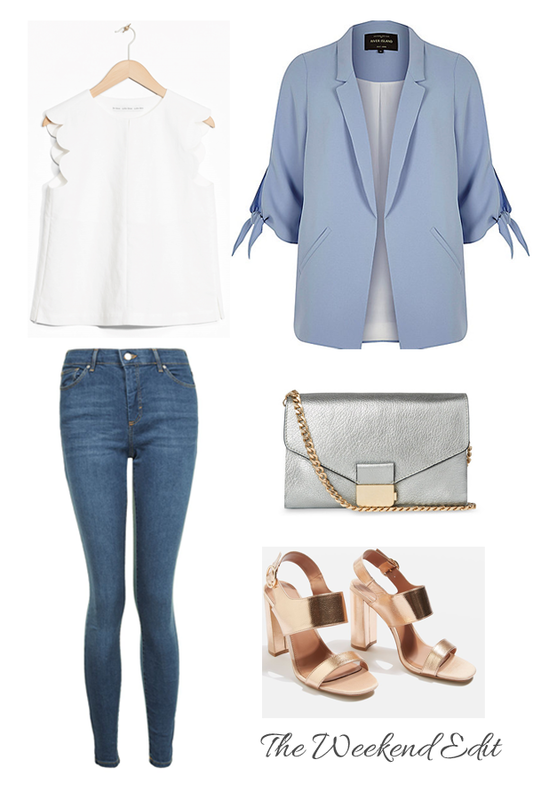 The powdery blue tone is so fresh and equally as gorgeous with denim as it is with white jeans. The fabric is also super lightweight and comfortable to move in. Some blazers can feel so restricted! I’ve kept the rest of the look simple with a little scalloped blouse – the dainty sleeves add an extra pop of pretty for when you slip the jacket off. To complement the cool tones, I’ve finished off the look with some gorgeous mixed metallics. This leather bag is a really versatile piece – perfect for any summer occasion, day or night. It’s on sale at the moment, making it an even more enticing investment piece!